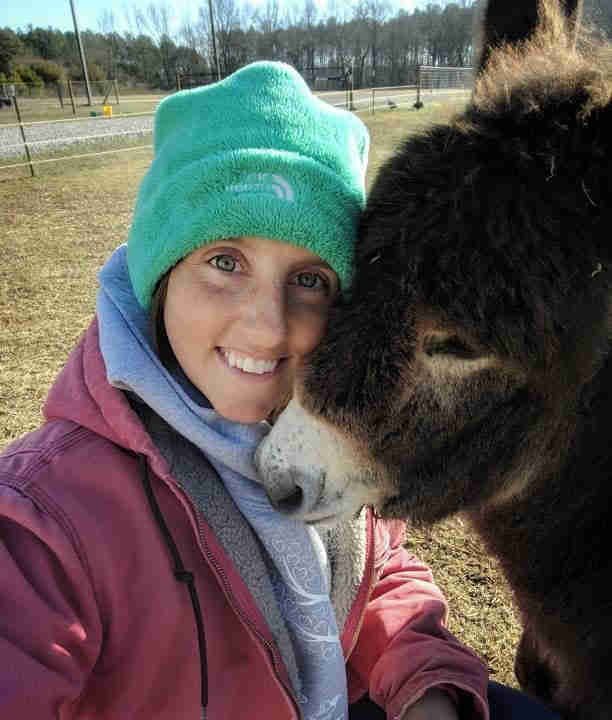 For 20 years, Tulip the donkey didn’t have a friend in the world. 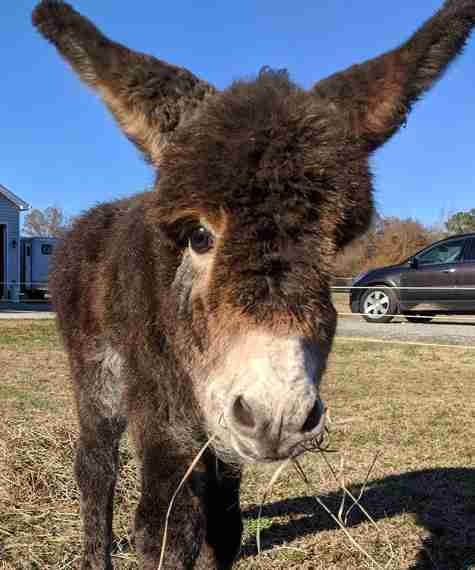 Left to fend for herself at a run-down North Carolina farm, Tulip had become so frail and sick over the years that she could hardly stand. Her hooves were extremely overgrown and curled upwards; her legs ached all the time, so much that she stopped eating. She had simply been forgotten about — and was on the verge of giving up. But then last spring, her miracle came. Someone driving past noticed starving Tulip lying down in the mud, and called animal control to report the neglect. 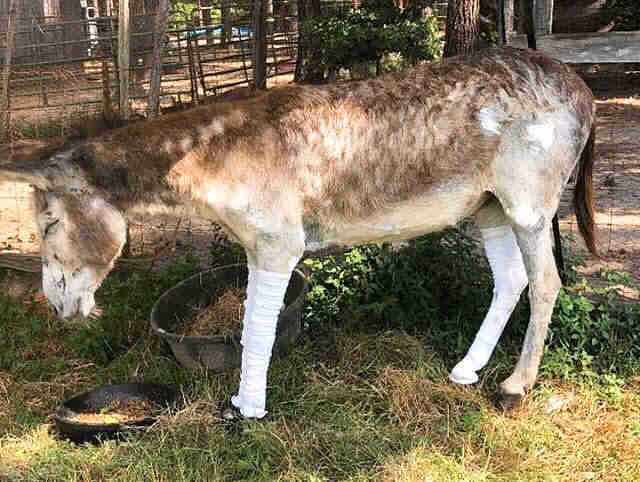 Local veterinarian Laureen Bartfield stepped in and brought the donkey home right away. Tulip was so weak, and it wasn’t clear whether she would live. But she had already made up her mind: She was going to fight for her life. Thanks to plenty of loving care, tasty food and medicine over the following weeks, Tulip slowly started feeling better with each day. 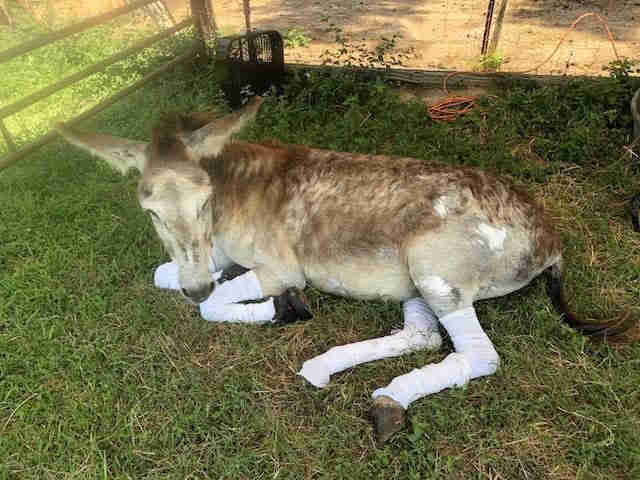 Her hooves were finally trimmed down after all that time, and she could slowly begin learning to walk properly again. Two months later and so much healthier, Tulip was headed to her forever home at Flare Oaks Rescue, located in Harnett County, North Carolina. Little did her rescuers know, Tulip had a surprise in store. 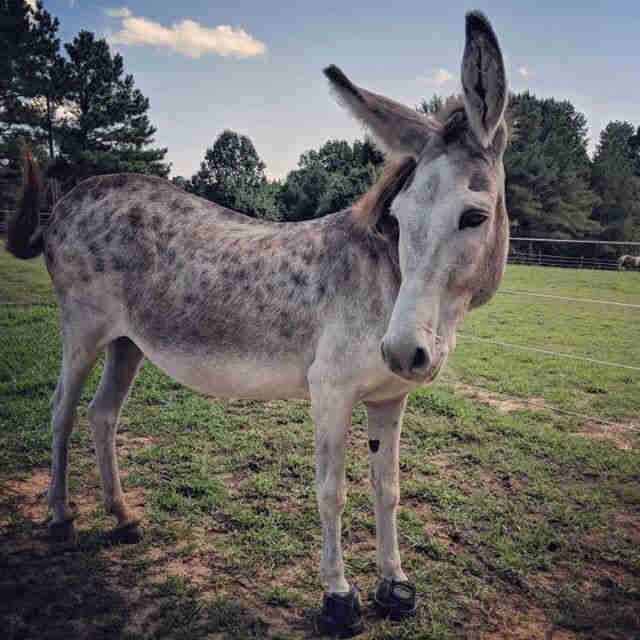 On Dec. 6, shortly after Tulip got settled into her new pasture, sanctuary founder Ashley Nelms noticed what looked like a dog lying out next to the donkey in the grass. As Nelms got closer, she couldn’t believe her eyes. 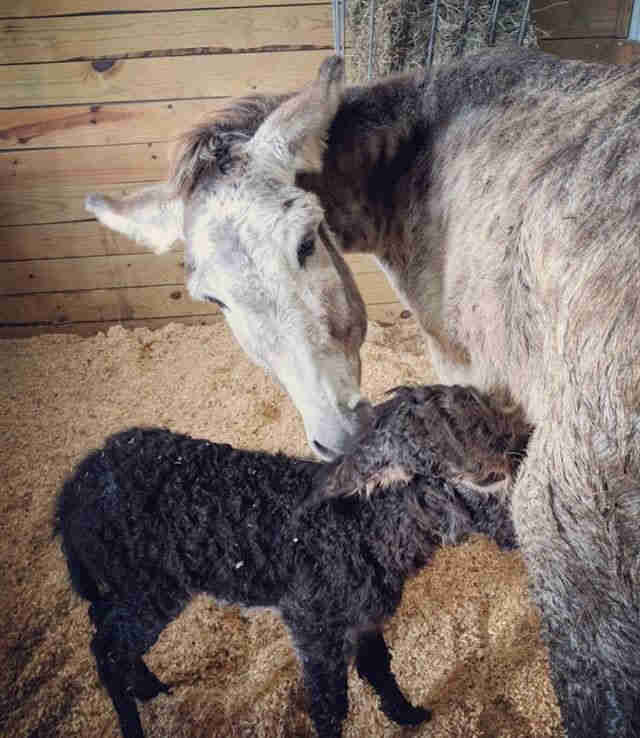 It was a tiny baby donkey, likely only minutes old. Tulip, after all this time, had a family. 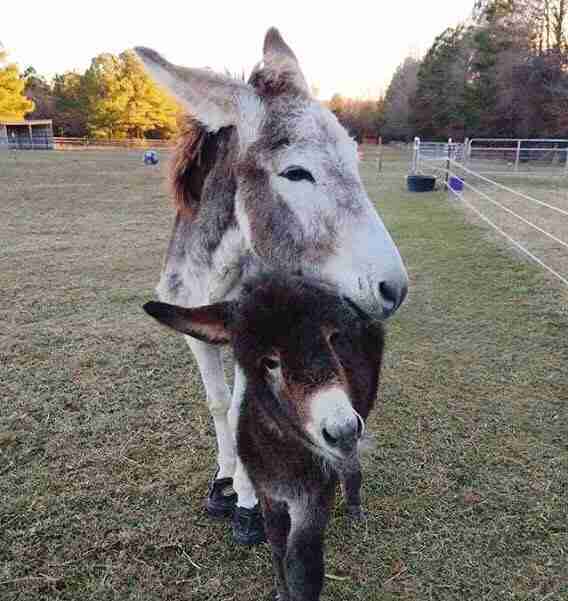 Since donkey pregnancies last around 11 months, it was clear Tulip had been carrying her daughter while languishing at her previous home — which made the baby’s survival another miracle in itself. 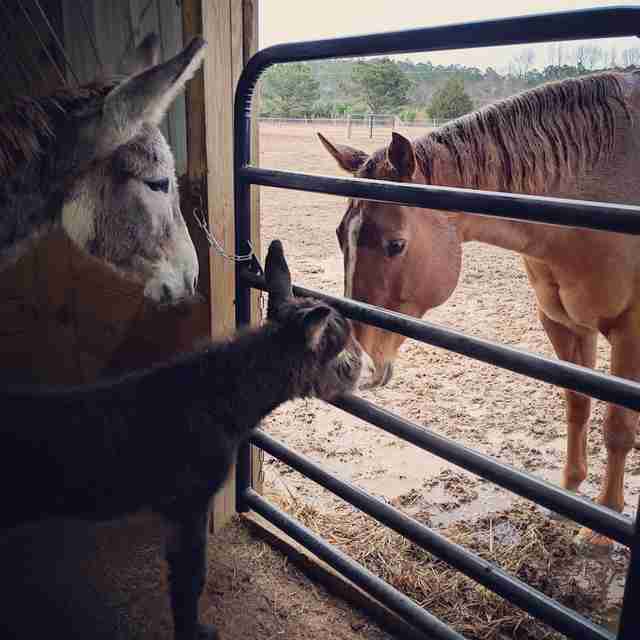 Completely overjoyed with the new arrival, Nelms rushed inside to grab blankets for the little foal and called Dr. Bartfield to share the news. They decided to name Tulip’s daughter Josie — and were in complete awe of how healthy and spunky the baby was. At only a few days old, Josie was already playing and running around the pasture as if she owned the place. Josie is having so much fun growing up at the sanctuary, and her sweet mom never strays too far from her side. Tulip absolutely loves having a daughter — and it shows. At just over a month old now, little Josie still has plenty of growing to do — but she’s already become quite the socialite around the sanctuary. She’s befriended plenty of volunteers, and even plays with the rescue horses. It took so many years, but Tulip has finally found her happy ending. Now, she’s making up for lost time spending her days grazing, relaxing in the sun and snuggling up with her daughter. It’s everything she could have ever wanted. 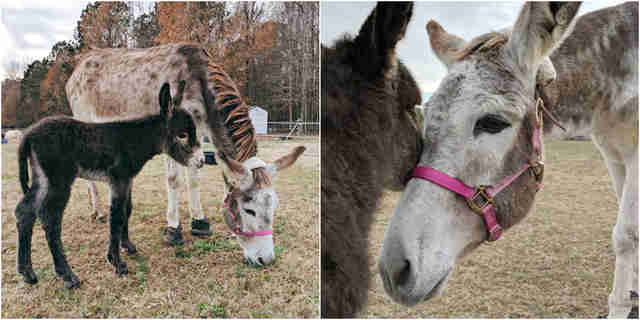 To celebrate Tulip and Josie’s new life together, you can make a donation to Flare Oaks Rescue.